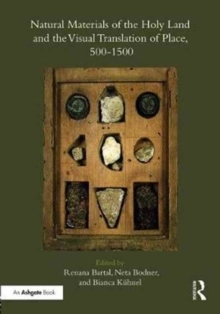 Natural Materials of the Holy Land and the Visual Translation of Place, 500-1500, focuses on the unique ways that natural materials carry the spirit of place. Since early Christianity, wood, earth, water and stone were taken from loca sancta to signify them elsewhere. Academic discourse has indiscriminately grouped material tokens from holy places and their containers with architectural and topographical emulations, two-dimensional images and bodily relics. However, unlike textual or visual representations, natural materials do not describe or interpret the Holy Land; they are part of it. Tangible and timeless, they realize the meaning of their place of origin in new locations. What makes earth, stones or bottled water transported from holy sites sacred? How do they become pars pro toto, signifying the whole from which they were taken? It will address their metamorphosis, natural or induced; how they change the environment to which they are transported; their capacity to translate a static and distant site elsewhere; the effect of their relocation on users/viewers; and how their containers and staging are used to communicate their substance.